Figure 1: Single-shot time-of-flight (top) and averaged photoelectron (bottom) spectra from Ar atoms and clusters. In the averaged spectra, the clusters show continuous electron intensity towards low kinetic energies due to multistep ionization in the developing cluster Coulomb field. Figure 2: Monte Carlo simulations of the electron emission from an Ar147 cluster. In the front each ionization step is shown individually. For comparison with the data the average spectrum and the spectrum con sidering all relevant broadening effects are displayed in the back as a solid black line. The soft X-ray free electron laser FLASH allows for the first time to probe the super intense light pulse – matter interaction at short wavelength, providing the basis for a large variety of studies with femtosecond X-ray pulses. We have performed a photoelectron spectroscopy study complemented with Monte Carlo simulations about the ionization dynamics of atomic clusters at FLASH at power densities exceeding 1013 W/cm2. We find that the cluster ionization process is a sequence of direct electron emission events in a developing Coulomb field. In contrast to earlier studies in the infrared and vacuum ultraviolet regime, there are no indications for efficient plasma heating processes. The current findings have large implications for the ionization and dissociation dynamics of nanometre scale objects illuminated by intense short wavelength pulses. Understanding the interaction of light with matter has been a central theme of physics for the past century. The invention of the laser and the continuing advance in laser technologies has made it possible to explore non-linear light – matter interaction leading to novel laser based concepts from particle accelerators to nuclear fusion . Currently, we are witnessing the advent of intense free electron lasers in the soft X-ray regime such as FLASH and in the near future also in the hard X-ray regime. One of the most exciting prospects of research with X-ray lasers is direct imaging of nonperiodic nanoscale objects, such as biomolecules, nanocrystals, living cells and viruses . Even though it is crucial for the success of the imaging experiments, understanding the interaction of intense X-ray pulses with atomic systems and the underlying dynamics is still in its infancy . In this context it is of fundamental importance to study how the absorption and ionization properties of extended systems develop in the short-wavelength strong-field domain. For such investigations, atomic clusters are ideal targets as hidden energy dissipation into surrounding media is virtually absent. To gain insight into the ionization dynamics of clusters in intense soft X-ray laser pulses, we have performed photoelectron spectroscopy (PES) at the 20 μm focus beamline BL2 of the FLASH facility on ArN with <N>=100 at hν=38 eV and power densities up to 5x1013 W/cm2, complemented by Monte Carlo simulations. PES is an ideal tool for investigating the light – matter interaction because the photoelectron energy distribution provides insight into the coupling between the photon field and the cluster. In the top panel of Fig. 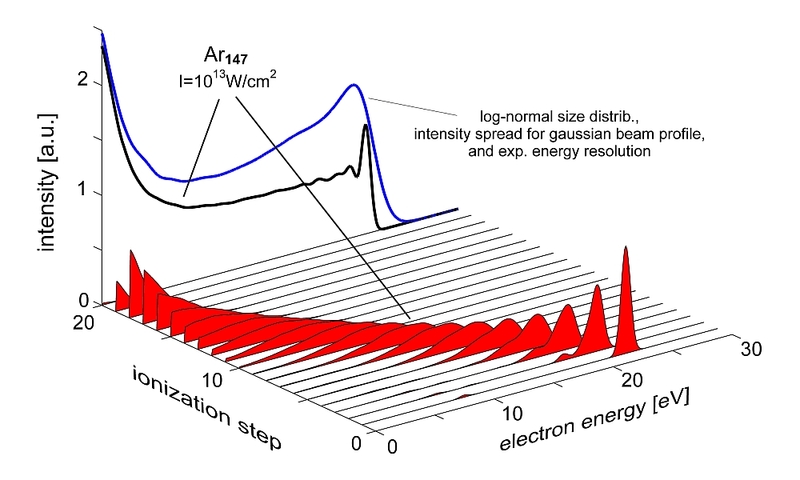 1 single-shot electron time-of-flight spectra for Ar clusters and atoms are shown. 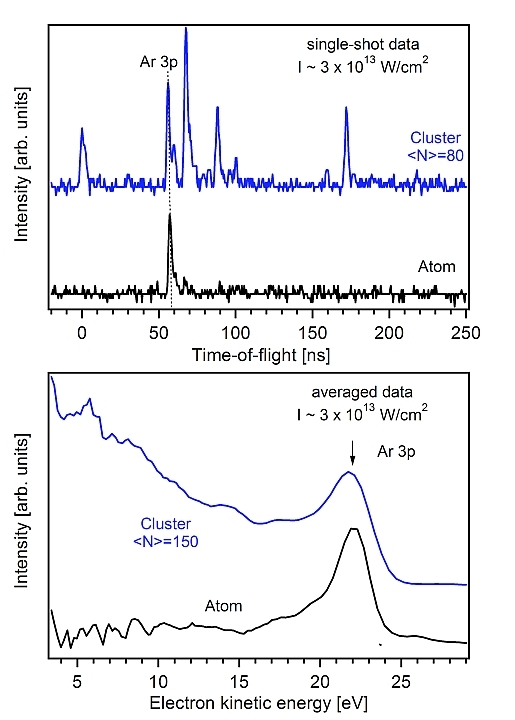 While the atomic spectrum displays only one peak at 57 ns flight times from the Ar 3p level, the cluster spectrum exhibits additional peaks towards longer flight times, indicating a series of subsequent ionization events. The increasing flight times, i.e., decreasing electron kinetic energies reflect the developing Coulomb potential of the cluster. The differences between the atomic and cluster spectra become even more apparent in the averaged spectra on a kinetic energy scale shown in the lower panel of Fig. 1. The cluster spectrum displays a continuous electron signal below the Ar 3p level. Except for the Ar 3p main line, all other peaks observable in the single-shot data completely average out suggesting a statistical photoemission process from the cluster. For comparison, photoelectron spectra are simulated with a Monte-Carlo approach assuming a statistical ionization of the cluster constituents with their atomic cross sections. In the model, the escape of the electrons is described as an instantaneous process. For calculating the final electron kinetic energies the effective cluster Coulomb potential is considered for each ionization process. In Fig. 2 the modelled spectrum averaged over about 104 simulations are shown for both, each individual ionization step and the overall spectrum. The spectrum of the first ionization step represents the photoemission spectrum of a cluster in the single photon regime. However, already for the second ionization step the spectrum becomes significantly broader and shifts towards lower kinetic energies. This trend continues until about the 19th ionization step, where the developing Coulomb field leads to total frustration of direct ionization for this cluster size. The sum over all single ionization spectra is shown as a solid black line. When further effects such as the Gaussian beam profile and the cluster size distribution are considered, the modelled spectrum shows a remarkable similarity to the experimental data in Fig. 1. In particular, the prominent Ar 3p peak and the continuous spectral intensity at lower kinetic energies are well reproduced. 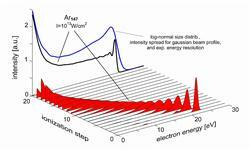 The observed cluster ionization at short wavelength as a multistep process of direct electron emission after single photon absorption stands in contrast to the processes in the optical and vacuum ultraviolet spectral regime. At longer wavelength, the intense laser field can efficiently couple to the transient nanoplasma through plasma absorption and collective effects. This results in extremely high absorption and electron kinetic energies clearly exceeding the incoming photon energies. The present experiments at FLASH show that for shorter wavelength the plasma absorption processes are of no significant effect. The transition from plasma type absorption at long wavelength towards the multistep ionization process has significant implications on the explosion dynamics of the clusters. The highly non-thermal nanoplasma created with soft X-ray laser pulses decay by explosion of the surface layers followed by hydrodynamic expansion and recombination of the nanoplasma core  because only a fraction of the photoelectrons can leave the cluster Coulomb potential. H.C. Kapteyn and T. Ditmire, "Ultraviolet upset", Nature 420, 467 (2002). R. Neutze, R. Wouts, D. van der Spoel, E. Weckert, and J. Hajdu, "Potential for biomolecular imaging with femtosecond x-ray pulses", Nature 406, 752 (2000). H. Wabnitz, L. Bittner, A.R.B. 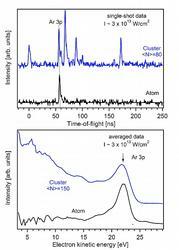 de Castro, et al., "Multiple ionization of atom clusters by intense soft X-rays from a free electron laser", Nature 420, 482 (2002). M. Hoener, C. Bostedt, H. Thomas, et al., "Charge recombination in soft X-ray laser produced nanoplasmas", J. Phys. B: At. Mol. Opt. Phys. 41, 131001 FTC (2008).